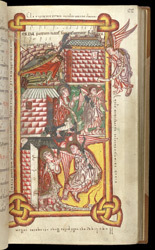 An unusual triple-scene page tells the dramatic narrative of Peter's release from prison. First the angel (top right) awakens him ('Arise quickly,' on the scroll in Latin). Next, Peter's thanks mark his freedom. Lastly, as the city gate opens and the angel departs, Peter realises what has happened. His words from Acts 12:11 also begin the introit antiphon (opening chant) for his feast and are echoed in the surrounding poem.